So, like many other internet savvy otaku, I have long been aware of the Katawa Shoujo project. At least a few of my friends have cosplayed as characters from the title, and I had seen the little fan comics that have floated around the internet about it. However, I imagine that like most people, I figured nothing would really come of it. After all, countless internet forums have had their goofy ideas for projects created by forum members, but usually you’re lucky if you get passed the idea and concept art stage. If that it doesn’t stop there, you’ll maybe see a very mediocre first level or some very rough animation at best. In fact, I can think of at least 2 or 3 I’ve been involved with myself in some small way. Usually, creative projects on the internet are most productive when one or two people do something with little-to-no external input. Yet, here we are with a full visual novel game with good art and good music, all inspired by single page joke from a decade-old doujinshi. It’s a miracle that it exists at all. However, that won’t stop me from nitpicking. While a lot of the aesthetic aspects of the game are remarkable for an independent, no-budget project, the writing starts off very, very slow. It’s vastly too wordy (perhaps like these blog posts?,) and the tone is a little too inwardly focused on the protagonist. To make matters worse, that inner focus is a bland self-loathing, the kind that you’d think an otaku-made project would avoid considering how commonplace that complaint is in regards to anime and manga. It’s also a bit inauthentic. One gets the feeling sometimes that the writers lack the life experience to communicate the right feeling in some of these scenarios. Maybe that’s to be expected a bit as well, but while it may make for an interesting meta-commentary, it’s a hassle to sit through walls of text that don’t really engage the player. To make matters worse, there are a lot of different dialogue options, especially early on, and that feels off for a game like this. Being able to take some ownership of the protagonist is critical in visual novels, and I wouldn’t have minded a bit more in Katawa Shoujo at all. Troubles aside, I can’t seem to really let it go now that I’m into it. It’s clearly a little undercooked, but I still can’t help but marvel that it was served at all. There are also a few sharp bits of characterization and humorous dialogue that manage to string the player along in spite of themselves, and that’s quite impressive since those pieces have to override the drawbacks. I’m certainly glad that I did a little tribute track to the game which will turn up on my next record because, if nothing else, it’s a nod to the efforts of people who beat the odds for fan projects on web forums. So, I have a new review up on ToonZone.net about Usagi Drop. It figures that long after I’d put the review to bed, it turns out the manga manages to have a bit of a train wreck ending, but the anime cuts it off while it’s still heart-warming and sweet. A rare moment where I really must say the show is better than the book. 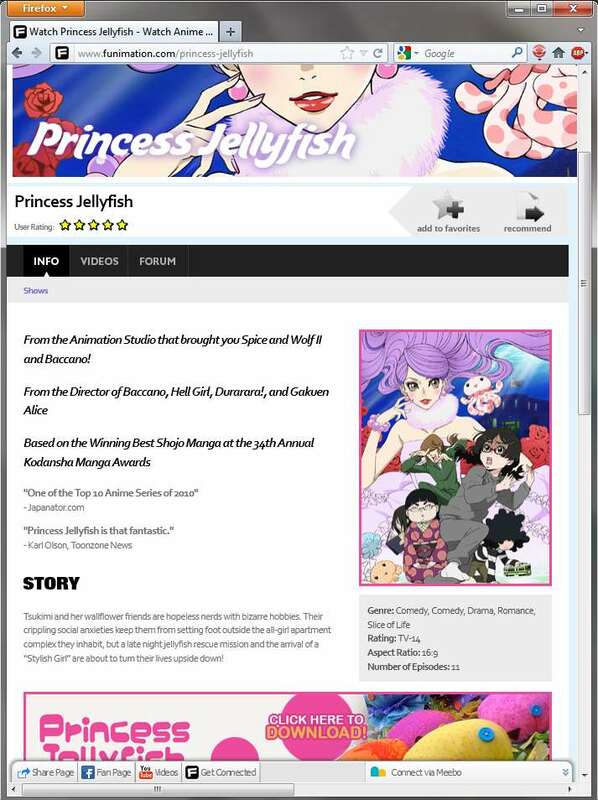 Speaking of reviews, it looks like one of mine has been quoted on the front page of FUNimation’s site for Princess Jellyfish (screencap here.) I really do hope the title does well for them. It’s a bit of a risk since it’s a fairly offbeat title. I suspect if it doesn’t payoff, I may not be quoted on another FUNimation webpage anytime soon, as I seem to have a habit of latching on to the offbeat lately, and they did post my review of Princess Jellyfish to their facebook page as a means of gauging whether a DVD/Blu-Ray release should be done. So, assuming I can come up with a simple way of doing so, I am going to join in the big SOPA/PIPA/OPEN Protest with Reddit, Wikipedia, WordPress and everyone else on the internet. This isn’t a political statement either (Baha’is are banned from participating in partisan politics after all,) it’s a simple application of the categorical imperative. If you can ban one type of speech from the internet because it threatens the livelihood or comfort of one group that is otherwise fully capable of protecting themselves, there is no philosophical reason that shouldn’t be applicable in any similar instance, and that seems intrinsically broken. The lack of due process in these laws only makes that worse as it’d be up to the accused to prove their innocence rather than the accuser to prove the guilt of the accused. The possibility for abuse seems close to limitless, and the odd splits between foreign and national websites seems entirely ignorant of how websites are hosted in the modern world. Thus, regardless of any ideology beyond reason and functionality, these seem like objectively negative and ill-conceived laws. I should mention I say all of this in spite of the fact that people pirate my music constantly (and when no money changes hands, I don’t care much because I doubt I really lost a sale in that instance,) including for-profit Russian pay download sites that sell my music without paying me royalties. I would benefit in that one instance, even as an independent artist, from SOPA/PIPA/OPEN passing. Justice would be served if that site was shut down, and/or they were ordered to turn over any proceeds from selling music without my permission. Unfortunately, much of the rest of the internet would likely be so paranoid about linking to any content without explicit permission it’d grind to a halt. Getting my name out to people is difficult if the sites I post content to have to dramatically alter their operations to comply with these laws. Without a reliable way to promote myself across the internet, my ability to find my niche audience is dramatically injured. Oh, and I know all the legislation acts in different ways, and there might even be enough exemptions that someone like me wouldn’t be affected in regards to my outward business. Alas, none of these laws can ever truly stop those who want to pirate media or counterfeit brand names, or rather, for them do so effectively might damage free speech in most instances. It’s a digital, democratized society, and we all have computers on our desk whose potential is effectively infinite in regards to creation and distribution, or at the very least, the only limit is the person behind the keyboard. It’s only going to be more intense as 3D printing gets cheaper and more precise. Want that that designer bracelet? Print it. Shoot, innovate on the existing design to make it more personal, cooler, better fitting and generally more useful. You can’t tell me that doesn’t sound radical yet exciting, and this is a world we are about to enter. Maybe there is even a market for selling branded designs for home recreation, but if there isn’t, that doesn’t mean the technology should be banned nor should it be ham-stringed by some kind of DRM-system that gets in the way of honest use. To put it another way, I know the idea that I can sell music and perhaps one day even merchandise is a bit dated as we near an era of home replicators. However, I would never risk free expression on the off chance I make a buck off of it, and I certainly wouldn’t want such a thing to be law. Free expression is why I can write music, write blog posts, have interesting things to read online and so on. Anyway, check in on Thursday for a decidedly fluffier and less weighty blog post. At the end of the last anime season, I genuinely pondered what I’d be watching next. None the titles really seemed to jump out at until I happened upon a forum thread about Ano Natsu De Matteru. Apparently, it’s from the same person who created the Onegai series, and that fact couldn’t be more obvious. The premise is virtually identical – a buxom, red-haired, alien girl falls right into the middle of a high school boy’s previous droll, pastoral life, much to the dismay of the boy’s childhood friend who happened to have romantic feelings for him. There are some key differences: in Ano Natsu the high school boy’s parents are dead instead of his sister, the uncontrolled decent of the spaceship’s arrival on Earth kills the high school boy in the opening minute of the show, and now only the alien girl’s kiss can keep him alive. Additionally, the alien girl is only an upperclassman this time, not his school teacher, and it seems that the childhood friend is let in on the alien girl’s secret identity from the start. Those little changes amongst others may have a dramatic impact on the flow of the show, even if many of the other characters in Ano Natsu are near facsimiles of the characters in Onegai Teacher. That said, while seeing an author who had previously breathed new life into the shonen romantic comedy genre simply phone it in should’ve left me bored, it’s actually really worked so far. The few bread crumbs that are different are so radically different that I genuinely wonder where they might lead. It doesn’t feel setup to reach the same finale either, at least in any obvious sense. Besides, the series had sold me in it’s first minute before they killed the lead. Much like Onegai Teacher, Ano Natsu’s first episode opens with a monologue from the male lead, and those monologues sold me then and now. It was so simple, so eloquent and clear that from those words that the creative staff have set the show up for a very poignant yet sweet journey. Well, with any luck they should’ve; Onegai Teacher maybe a timeless anime, but Onegai Twins was slightly mediocre. Perhaps that risk makes it compelling as well – it’s a romantic comedy fused with NASCAR. Anyway, I’m quite glad it’s been pre-licensed by Sentai Filmworks – I’ll probably be catching it on DVD or Blu Ray by the time CrunchyRoll finishes streaming it. Comments Off on Reduce, Reuse, Recycle.